1 Cue Module for the FireStorm Firing System. The RX1 firing module is ideal for body hits, single pyrotechnic squibs, stage pyrotechnics, SFX, airsoft / paintball pyrotechnics and many other applications requiring a wireless pyrotechnic firing system. The RX1 is small enough to be easily concealed on actors or props and yet rugged enough to survive the most demanding applications. 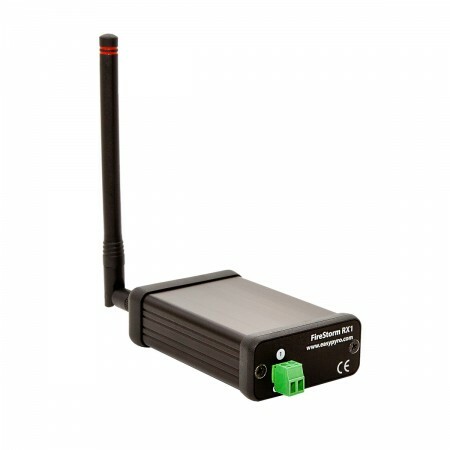 The removable antenna allows alternate antennas to be supplied i.e. for maximum range or small size etc and our proprietary bi-directional communications give total confidence the cue will fire. The RX1 firing module is controlled from the TX1 or TX2 transmitter. Small (80 x 54 x 23 mm excluding antenna). Fire 4+ igniters per module. Can your other firing system offer this?